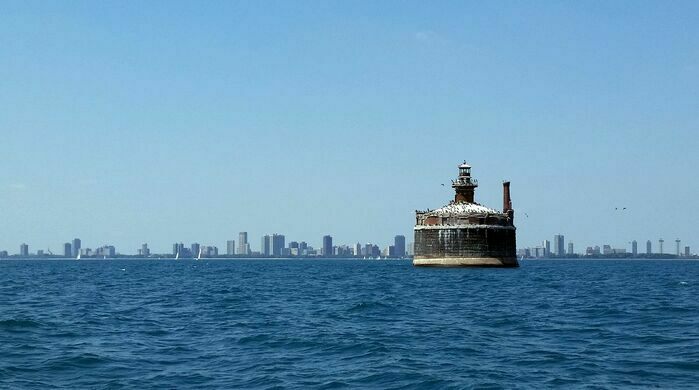 The Chicago water cribs are the only visible portion of the century-old tunnels that carry drinking water to city taps. 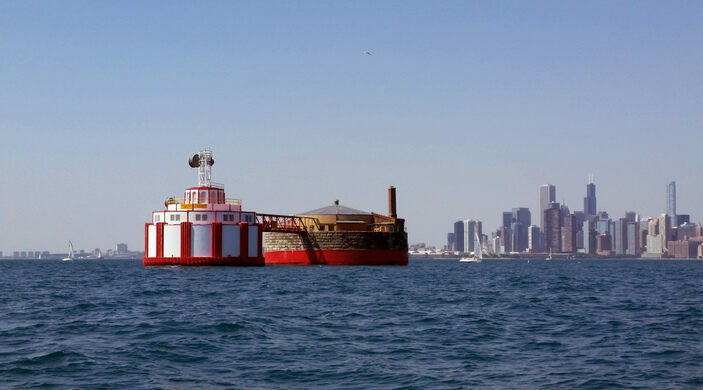 The circular stone structures protect intake vents that connect with brick-lined passageways hidden 200 feet under Lake Michigan. 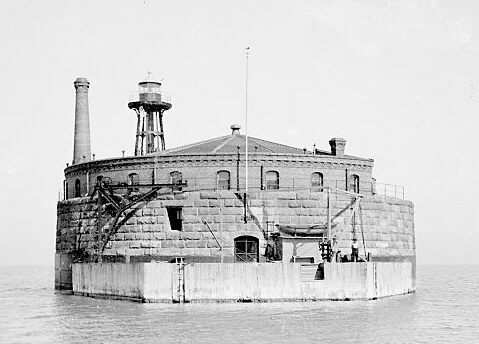 The first Chicago water crib was built in 1865 at the tail end of the Civil War as the population boomed and water resources stretched thin. Residents had traditionally drawn their drinking water from the river and lake, but near-apocalyptic levels of industrial pollution had transformed both into a public health threat. “It was true that Lake Michigan was quite as foul as the river, near its mouth, but at a certain distance from shore the water became, as pure as Croton, cold and clear as crystal. The contaminating influences of the Chicago river possessed no power over the waters of the lake, at a distance of two miles from shore. 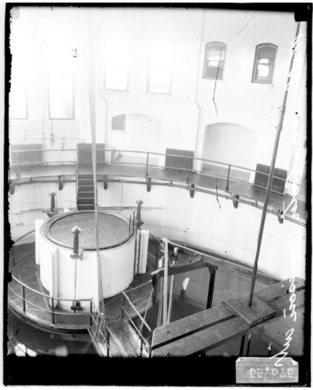 Here, then, was an eternal reservoir”. The initial wooden crib was constructed on land and floated two miles from shore. There, it was filled with rubble and lined with armor to protect against collisions from ice or ships. Tunneling under the lake commenced from both directions and was done entirely by hand, 15 feet per day. Sappers had to contend with tight five-foot high spaces, thin air, and the constant terrifying prospect of a tunnel collapse. A miniature mule-powered rail car was installed to ferry the endless amounts of spoil out of the excavation. 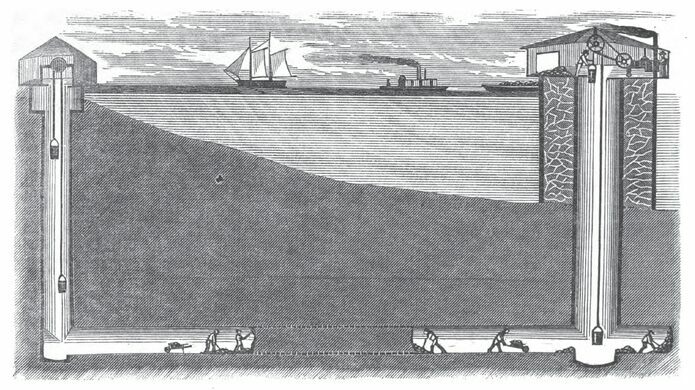 When it was completed, awed commentators reported the underwater tunnel was the “greatest the world ever saw, and beside of which the tunneling of the Thames was mere child’s play.” But 30 years later it was necessary to double the distance and build another four miles out. Over the years increased demand and pollution led to the construction of a total of nine water cribs. Up until the 1990s, teams of “crib tenders” actually lived out on the lake in week-long shifts to keep debris and fish from fouling the vents. During winter they used hand tools—and sometimes dynamite—to prevent the life-sustaining cribs from freezing over. Two of the water cribs are still active, though they’re now automated.